For a long time, there has been no industry standard for setting the warmth rating of sleeping bags. Manufacturers were free to label their sleeping bags as they saw fit, leading to great disparity between companies' ratings. For example, The North Face is notoriously optimistic; Marmot is generally conservative. Consequently, a +15 degree bag from Marmot is almost always warmer than a +15 from TNF. Plus there has always been widespread confusion about what the temperature ratings are supposed to indicate. The lowest temperature you'll sleep comfortably? Or survive the night? Now a new standard rating system is steadily being adopted by major gear manufacturers: The European Norm. 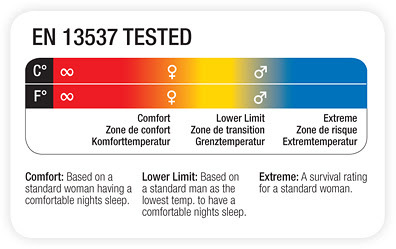 Used as the sleeping bag standard in Europe since 2005, the European Norm (or EN 13537) uses a standard laboratory test to provide a range of temperatures based on gender, comfort, and survival levels. Bags tested to the EN 13537 standard carry a label that looks like this: The red, orange, and yellow areas indicate the comfort zone, or the maximum and minimum temperatures in which a user would sleep comfortably. Women tend to sleep colder than men, thus the lowest comfort temperature for women is higher (indicated by the female symbol in the orange area) than men (male symbol in light blue section). At the far end of the spectrum is the survival rating, or "extreme" minimum temperature at which a woman would survive the night without getting hypothermia. So for example, a sleeping bag labeled as a +15 degree Fahrenheit bag would have an EN comfort level for women of approximately 27 degrees, men +15 degrees, and an extreme/survival rating of -16 degrees. EN ratings are determined using a standardized laboratory test involving a sensor-laden heated mannequin in a sleeping bag inside a climate chamber. The test is designed to simulate ratings for a standard man weighing 80kg (176 pounds) and woman weighing 60kg (132 pounds). Keep in mind that the test and ratings assume that you are fully zipped into the sleeping bag, with your head cinched and sealed up in the hood (and neck baffle sealed if present). Also keep in mind that there is a wide range of factors influencing how warm you sleep, including your metabolism, sleeping pad, and stomach/bladder contents. Some people may find the EN ratings dead-on accurate, while others will find them off by a significant margin. Whatever the case is, having a standardized rating system will help you accurately compare bags from different companies. So far in the U.S., REI, Marmot, and Mountain Hardwear have adopted the EN rating system—look for more manufacturers to follow suit in the next few years.